Culinary products and experiences inspired from getting Out of Abilene with nods to good stuff coming Out of Abilene. Plus, food stories/histories. Hum. Hum. Black bean green chile dip. 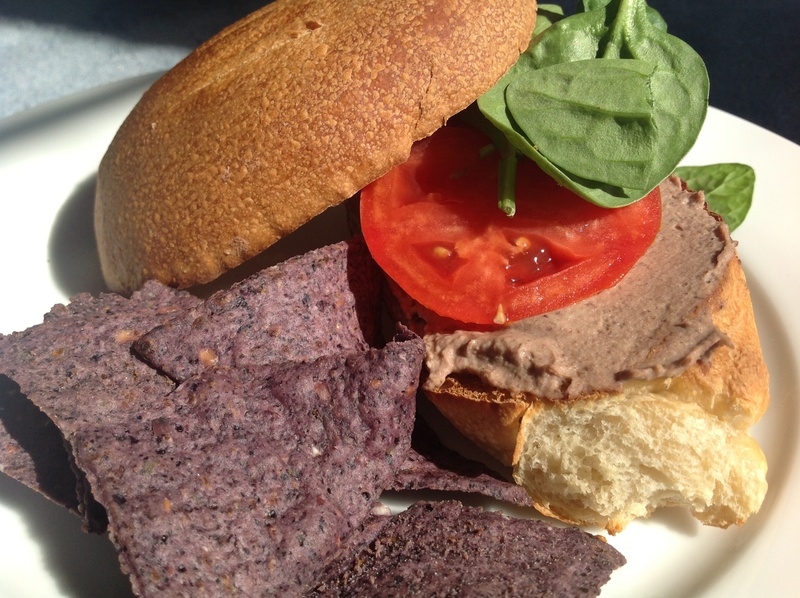 Black bean green chile hummus spread on a toasted bun and paired with homegrown tomatoes, spinach and blue corn chips. Chickpeas. Tahini. Kosher salt. Hummus. The foodies in my family dig on any recipe with the name hummus in it. The other half’s eyes glaze over with all that Middle Eastern talk. Why don’t I just show up at the table wearing a Barack Obama Tshirt and greet them with As-salamu Alaykum instead of the traditional “howdy”? Like changing any culture, mindset or palate, it’s about small steps, accessibility and tapping into what is familiar. Hence, we have black bean and green chile dip/spread – referred to (with a wink and a whisper) by family members in the know as black bean, green chile hummus. Black beans (familiar but somewhat exotic in a region that exists on pintos). Green chiles (gotta tap into that southwestern need for heat). Tahini (I had to keep it. I just don’t tell certain people about it, though one friend did suggest subbing Jif and really trashing things up. Yeah baby, spread this spread on Wonderbread with a smear of Miracle Whip. I don’t think so). Now comes the hard part of this recipe. Put it all in a blender and mix it up. Pause every 10 seconds or so and mix things up with a tamper or a spoon or you will likely burn your blender’s motor up. You could also try blending the ingredients in stages. I don’t think you get the full flavor if you eat it straight out of the fridge. I let it sit for a few minutes and allow the temperature to drop. Now that we’ve made hummus more accessible, how do we do something similar with baba ghanoush? Muhammara? Tabouleh? Dolmas? In the meantime, tell me what you think of the black bean version of hummus, the adjustments you made and any dishes you would like to learn in the future. I’ll be your test kitchen guinea pig and relay everything I learn via this blog. If you enjoyed this recipe (or the post), please hit “like” below. It helps more people see not only this post but the blog as well. 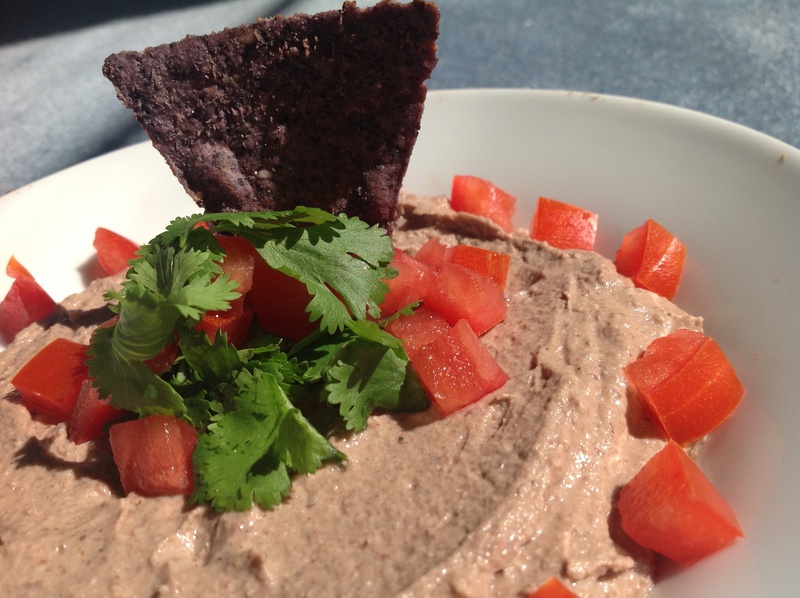 As a dip, black bean green chile hummus pairs brilliantly with tomatoes, cilantro and blue corn chips. 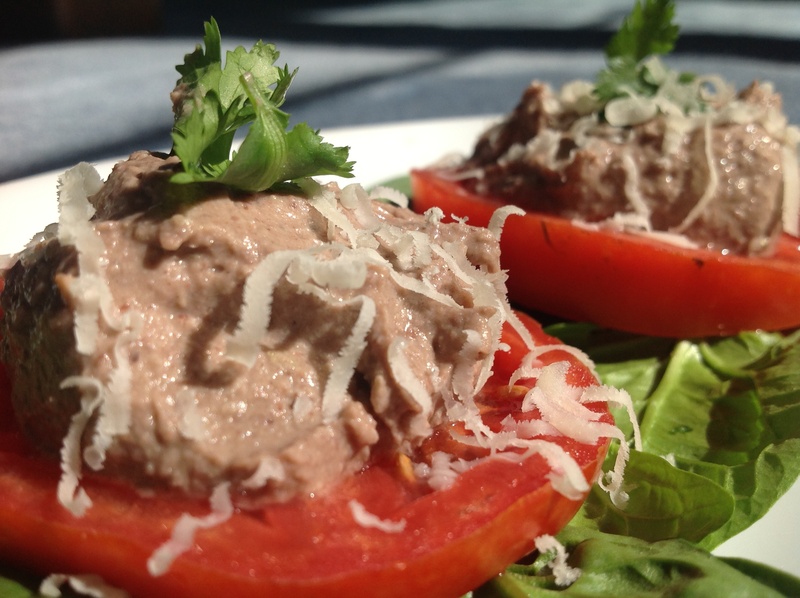 Black bean green chile hummus atop homegrown tomatoes with a little cilantro thrown in for brightness. This entry was posted in Culinary and tagged black beans, dips, green chile, hummus, olive oil, vegan, vegetarian on October 25, 2014 by Out of Abilene.